Girl is NOT a 4 Letter Word: Meet Female Skate Legend Patti McGee! Meet Female Skate Legend Patti McGee! Patti McGee is hitting the road this Summer. This OG legend and cover girl, (Life Magazine and Skateboarder Magazine), will be coming for the Border, starting in Southern California and headed to Vancouver, visiting local Skate Shops and Destinations near you! Her first stop is this Sunday June 10th from 12-4 at SoCal SkateShop in Mission Viejo for a Meet and Greet Session. 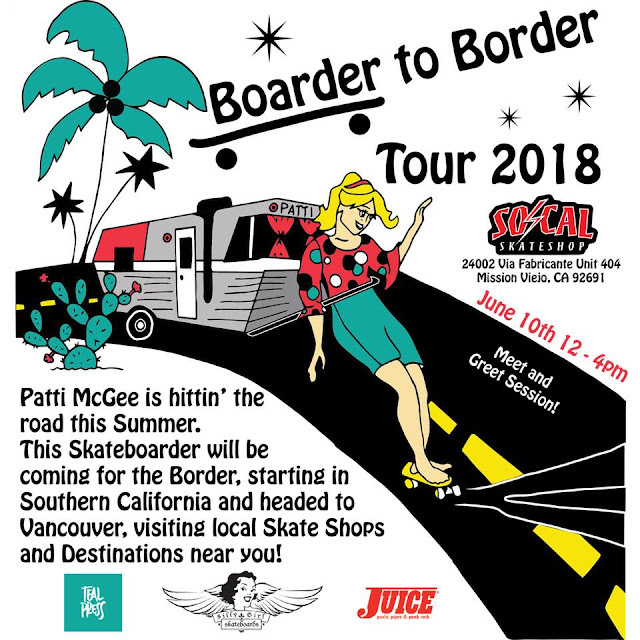 Bring your Life Magazine or Signature Patti McGee boards, there will also be plenty of her new #cactusmcgee decks available. Stay tuned for more dates TBA!